Harold is 98 years old. He was called up in June 1939, before the start of the 2nd World War and joined the Staffordshire Regiment. He was part of the British attachment that joined up with American Forces that landed on Utah Beach in June 1944. He helped to liberate France and then entered Germany where he stayed until 1946, helping with the new Administration, before returning home. 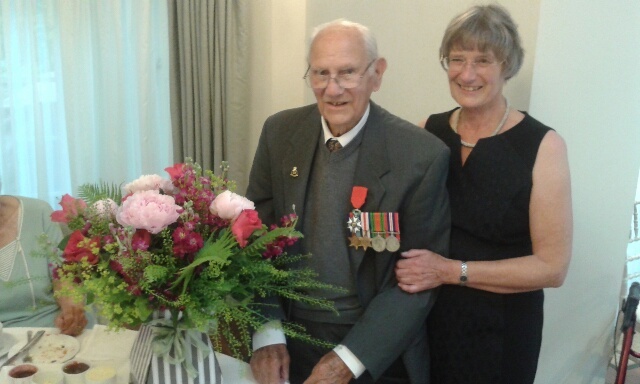 Harold was nominated to receive the French Legion d’Honeure which is one of the highest French honours. It is presented to members of the armed services who helped to liberate France. It was presented to Harold by a representative from the French Embassy at a ceremony held at the Falcon Inn in Uppingham. The ceremony was also attended by the Lord Lieutenant of Rutland and a representative of the Staffordshire Regiment along with 50 invited guests.